Nautical has always been on of my favorite trends. If I was brave I would break our the fabulous vintage shots of me in my nautical attire...but I am not that brave...so instead I will show you my more modern and on-trend take on Nautical, one of the hottest looks for the season! 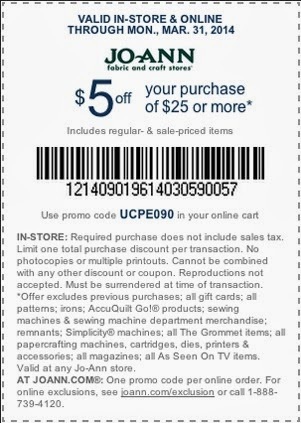 Jo-Ann Fabric and Craft Store makes spring crafting easy during National Craft Month with a $5 off $25 or more purchase coupon and a spring crafting inspiration website. 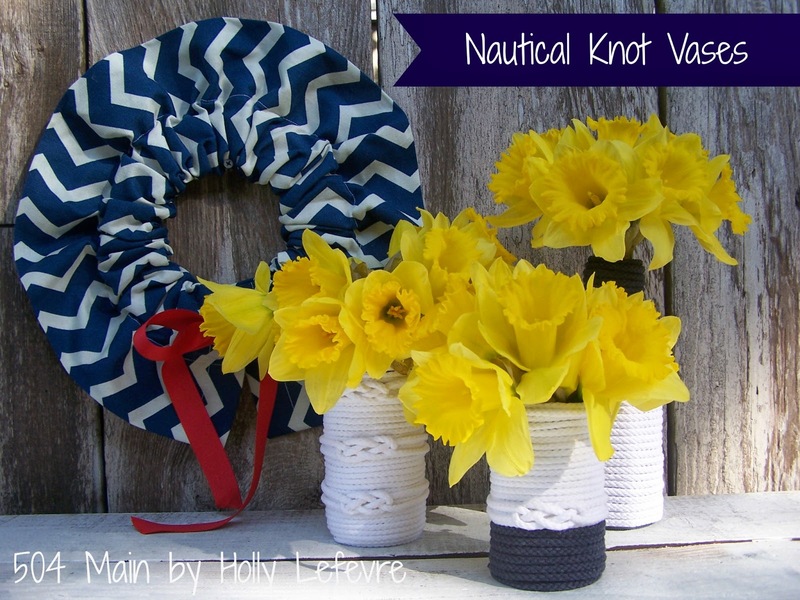 What do you think of when you think Nautical? 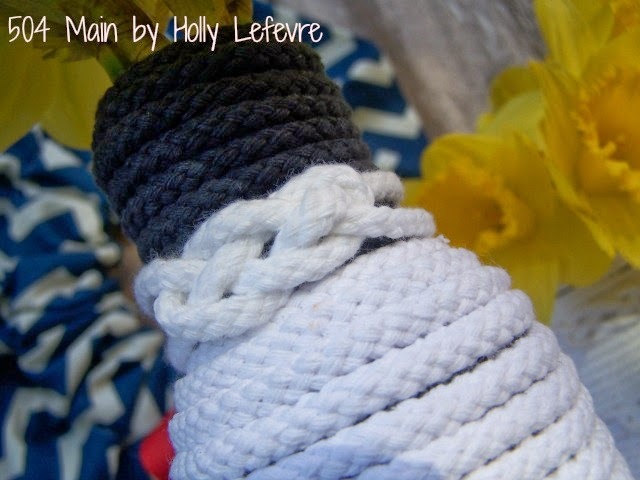 I think navy, white, rope, stars, bright gold accents, and knots. Well, in honor of National Craft Month, I headed to Jo-Ann Fabric and Craft store to grab some supplies to create a nautical vignette. And, let me tell you...this look make me so ready for bright sunny days and ocean breezes. *Note: I used almost 6 yards of white to cover the large jars. If you are mixing the navy and white you need less of each color. You need the additional drawcord for the knots. Additionally, you can used piping or cording that is a poly/cotton combo, found in the upholstery section, but I prefer a 100% cotton cord, and purchased mine from the sewing/trim section. Glass jars. I used a combination of mason jars, jelly jars, salsa jars, and even a salad dressing bottle. Remove labels (if any) from the bottles. Wash and dry completely. Cover your work surface to protect it. Begin wrapping your cord aroudn the jar, beginning from the bottom. 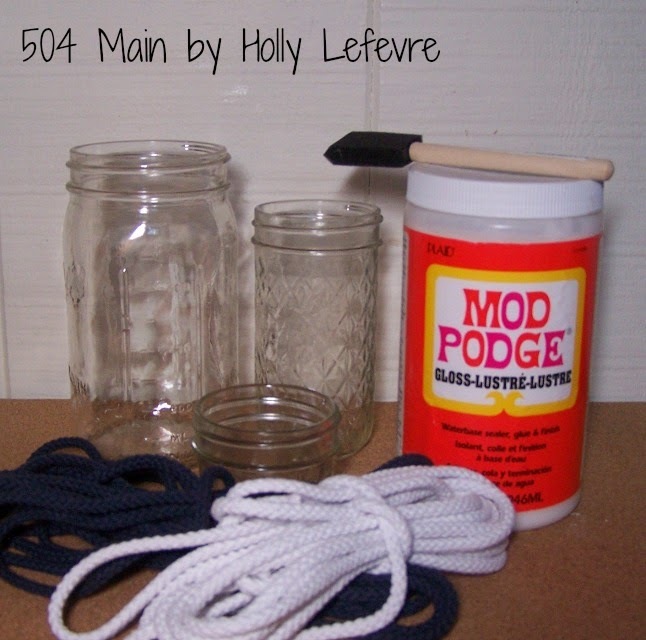 I applied Mod Podge all over the bottom portion (but not on the bottom) of the jar. 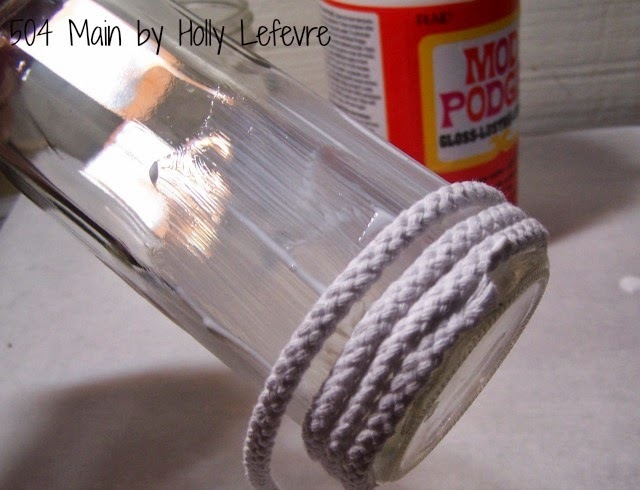 Holding the end of the drawcord, begin wrapping it around the jar/bottle, pushing the cording together as you wrap, so prevent gaps in the cord. I began my jars flipped over (opening down) and then after a few wrap, flipped the jar back to its regular position (opening up). You just need to do what feels right for you. Some jars were easier to hold and twirl. Continue wrapping until you reach the top. I tried to end my wrapping on the same side of the jar as I began it, just in case you has an issue with seeing the ends of the cord. If you are doing multiple colors, cut off the cord when you have reached the height you desire (I also tried to end the wrapping on the same side I started for this too). Then begin the next color and wrap it until the top. 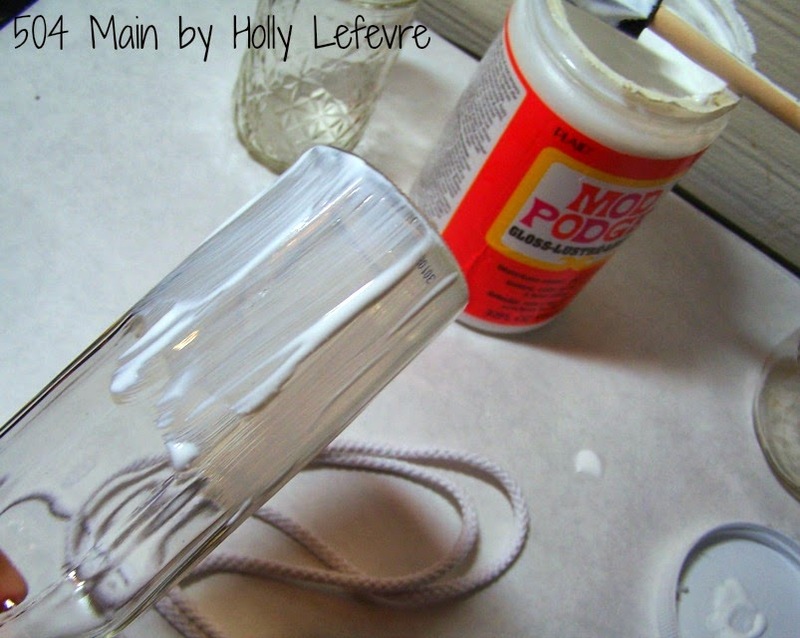 NOTE: You can use clothespins or rubber bands to hold your drawcord into position as the Mod Podge dries. I personally did not need to. I just held the end in place for a 30 seconds or so and then let them dry. I thought about adorning my bottle with small embroidered stars, but I changed my mind...because nautical knots were calling to me! Place one cord on the table, make a loop with the "top" tail under the lower tail. Take the second piece, lay it under the loop of the first strand; over the tail of the upper tail; under the lower tail. Hold the bottom left and top right tails, with your fingers as you pull the top left and bottom right tails. Do not pull all the way...just enough here and there to get the size you want. 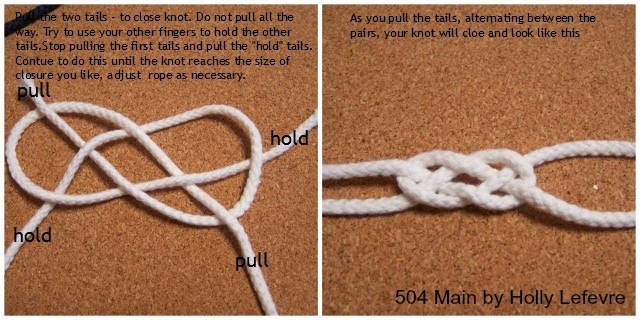 Make as many of these knots as you need. 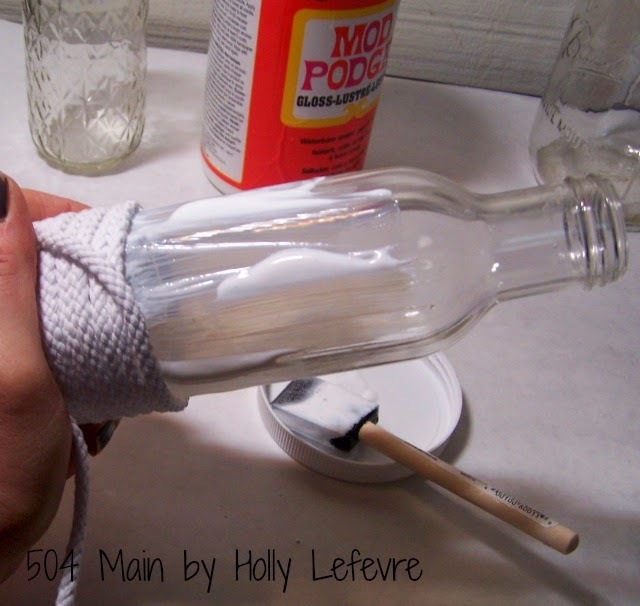 Then just place them on the jars/bottles; wrap around and tie off in the back. NOTE: I tied mine so I could remove them if I want...but you can also glue them to make them permanent. What's your favorite Spring Trend? Jo-Ann makes spring crafting easy during National Craft Month with a $5 off $25 or more purchase coupon and a spring crafting inspiration website. 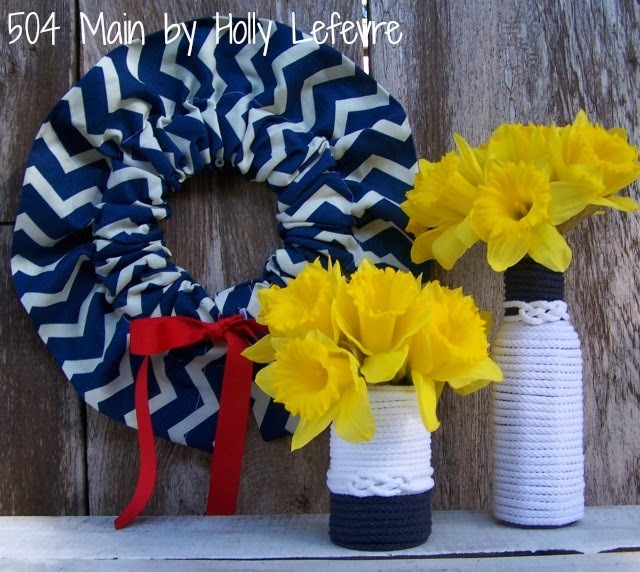 This post is written and created at 504 Main by Holly Lefevre The following review is part of the Jo-Ann Fabric And Craft Stores® National Craft Month campaign. I received compensation for this review; however, this is my personal, honest opinion based on my experience. 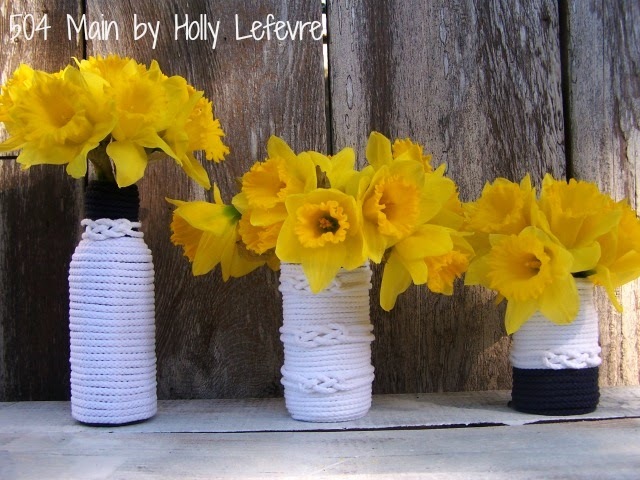 Love your vases, Holly! I also love your wreath too! You make it all look so easy Holly. Knot tying is quite an art in-itself. The pics sure are helpful though. Love the nautical look. Makes me think of summer and vacations in North Carolina! Have a lovely day. 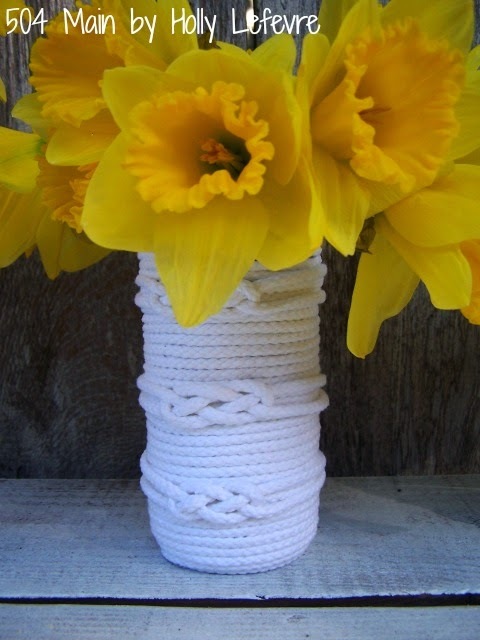 Thanks for the tutorial on how to make these darling vases. I just save several jars which I would say is perfect timing. 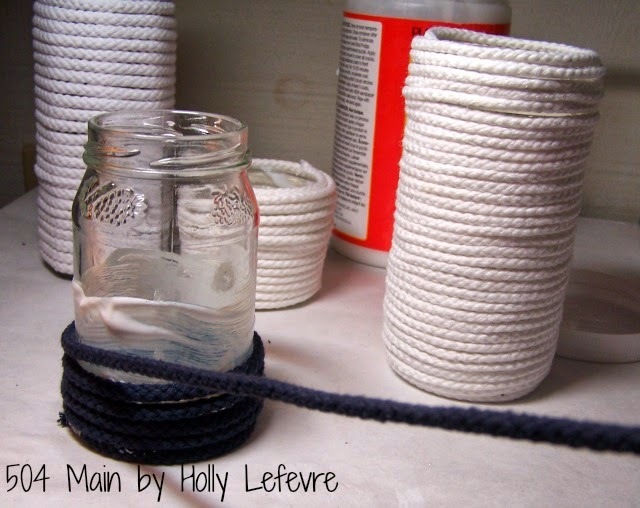 Plus I already have the rope and +Mod Podge too.